Now you can take on the whole political army in San Jose, actually that is just a start. Just one problem, picture of graph does not show up. And the fiddly bit between Fremont and San Jose in the East Bay for the high speed trains. I haven't laughed that hard in months, thanks. First of all, neat tool. It clearly required a fair bit of unpaid time and programming effort, so kudos for that. Why on earth would you terminate Dumbarton trains at RWC? Why not continue onto San Francisco as express trains, maybe stopping at just RWC and Millbrae on the way? Of course you'd have to reduce frequency to something less than 4tph, but even so I think a one-seat ride from Livermore/Tracy/Manteca/Stockton to downtown SF would be a huge commuter draw. Your Altamont scenario actually requires more 4-track segments than Pacheco. I know frequency is increased so it's not apples-to-apples, but still... what you've done is moved the areas where 4-tracks are required away from PAMPA simply because they complained the loudest. I don't see that as the best way to make engineering decisions. Yes, I know I should make my own timetable rather picking holes in yours. 1. Terminal capacity in SF. 2. Apples and oranges, indeed. "your Altamont scenario actually requires more 4-track segments than Pacheco." As you suggest, it isn't apples to apples. In particular, the illustrated 4+4+4tph Altamont scenario is full corridor built-out, including plugging the 3/4 track San Mateo narrows, while the 3+3+3tph Pacheco scenario doesn't. And the former is also for higher trains speeds. So, indeed, apples to oranges, on several fronts. "Why on earth would you terminate Dumbarton trains at RWC?" Sending more trains up to SF just makes the problem worse, and there's a point where alternatives (just for example, a cross-platform transfer in Redwood City to an express train headed to San Francisco) are such good compromises, regardless of slogans like "transfers kill ridership", that they cry out to be investigated. So the answer is: it's physically possible to run more trains than shown up the line (in fact, if you don't have spare capacity available you don't have a system that can operate at all except on paper), but it's not necessarily a the best idea to plan on doing so. In general, it's easy to run lots of trains if (a) none stop and most especially (b) none stop and reverse. As rambling but not off-topic background: the reason that Altamont is so attractive -- aside from the little matter of the $15 or $20 billion or so we come out ahead by getting SJ-Fremont, Fremont-Redwood City and Fremont-Stockton for free, while not stomping on some people's backyards unnnecessarily -- is that not sending San Jose HS trains to pile up in San Francisco, and not sending partly-empty HS trains up the line to clog up the tracks, is a huge economic and service provision win. It comes out ahead on the economic front because there is no "need" to construct two separate terminal stations in San Francisco -- one at Transbay which is 70% given over to HS exclusively, another a mile away from the CBD at the existing terminal where most Caltrain passengers will be dumped off because there isn't room for their trains to proceed further. The service provision front is the same: fewer unnecessary HS trains gumming up Transbay means more (even all) regional trains reaching the station that is guaranteed to be most used on the whole line. As usual, sorry for any broken links or typos. Ah, I see you have a timed transfer at RWC to and from Caltrain express trains. That makes more sense. Somebody should. 6 platforms seeing three trains an hour would mean 18 trains an hour. Most stations don't have 90 degrees turns at the end of the platform. That's going to affect how fast you can move trains in and out. The 90 degree turn a few blocks away isn't particularly helpful either. 18 trains an hour might happen if cars are banned. What is the terminal capacity assuming trains are turned expeditiously and don't spend a half hour basking in the LED lighting down on track level? Richard: just so I know, how many trains could you realistically hope to turn back at Transbay? (given realistic operating assumptions of course). Or, more usefully, how long should it take to turn back a CalTrain EMU and how long for a HST, including time taken to enter/exit a reasonably designed station throat? Richard- thanks for the informative response. Personally, to deal with the capacity issue I would drop 1 or 2 Caltrain or HSR trains per hour and replace them with 1 or 2 Dumbarton trains per hour. Given that ACE currently runs just 1 tph Stockton to San Jose I don't think that's an unrealistic starting point. I would also be interested to know what the turnback capacity of Transbay is, both realistically and with the pessimistic CAHSR assumptions. I agree it's nuts that CAHSR and Caltrain intend to terminate any trains at 4th & King. The number one barrier to Caltrain ridership is the distance from the CBD. I'm not a regular Caltrain rider but I had reason to travel from San Francisco CBD to San Mateo during evening rush hour a few time last week; each time getting to 4th & King was a nightmare and took longer than the Caltrain ride itself. Buses get gummed up by rush-hour congestion and Muni trains get gummed up by crowds at the ballpark. Even the Central Subway won't improve things for most people due to the two-seat ride and long walk to transfer at Powell/Union Square. Branching (which is effectively what the current plan is) divides frequency; why have 50% frequency at two terminals one mile apart when you can have 100% frequency at one terminal? Of course, the reason we have this mess is that Transbay was designed for Caltrain only. With the current design there is not enough capacity for both Caltrain and HSR, but no-one wants to revisit the design for risk of jeopardizing federal funding for the project. Transbay needs either more platforms or run-through tracks, with the latter being the cheaper option. Of course you already know all this. According to Clem, "The assumed HSR schedule turn-back time is 30 minutes, with a nominal platform dwell of 20 minutes, giving the four HSR tracks a total throughput of 6 high-speed trains per hour (after accounting for the delay required for another train to re-occupy the platform). The Caltrain schedule turn-back time is 20 minutes (nominal dwell of 18 minutes), giving the two Caltrain tracks a throughput of about 4 trains per hour (or 6 tph with tail tracks)." Richard, is there any way your applet could accept fractional minute numbers? There's no other way to make the schedule symmetric with 7% schedule padding. Does anyone know the cost differece between the DTX as 3 tracks versus 2 tracks? With this value engineering happening systemwide, and the Authority now contemplating temporarily terminating trains at 4th/King, could the TJPA and The City reconsider the idea of 3 track ridiculousness? What kind of sway could the Authority Townsend station and DTX? Richard makes a couple good points. If they're seriously thinking about using both 4th/King and Transbay as HSR terminals, that's just ridiculous. If they're building two terminals in the Bay Area, they might as well make them SF and SJ and save themselves some money that way. The other important point to remember is "if you don't have spare capacity available you don't have a system that can operate at all except on paper". Trains WILL be delayed, and if there's no recovery time or spare capacity in the timetable, then the delays will just cascade. Wouldn't it be a better idea to reduce the turn around times to 15 minutes, 5 unload, 5 for cleaning, 5 load, and get it out? Yes, it would, but no one is listening. I haven't answered a specific answer for what (I believe to be) Transbay (as grotesquely misconfigured by the TJPA's transportation professionals, or as it might have been salvaged in some less insane alternate reality) because, well, the dog ate my homework. At one stage I wrote a very (ie insanely) detailed micro-simulation program to model various station configuration throughputs, but it seems to have disappeared in some disk backup catastrophe sometime, and I am not feeling very happy about that at all. To make up for it, I spent some time today scraping the public railway timetables of Switzerland -- far and away the western world's most competently operated railway network -- to check how often and long their planners and engineers believe a terminal platform can be used each hour to turn trains around as part of a stable national network of timed, coordinated services. Those who are interested can poke around at various station platform occupancy diagrams I generated in various files named http://www.pobox.com/users/mly/SBB/20110407-anab-*. Zürich HB (3-18 and 51-54 are terminal tracks; 1-2 are an odd shuttle case) and Luzern (all tracks are terminal; 12-17 are only for narrow gauge trains) were the obvious interesting cases. Reversing two trains per hour per platform face seems to be about as much as the Swiss think they can get away with in a stable and ongoing fashion. Alon: re sub-minute schedule specifications: You're in too deep! If you're that worried about nailing the N/S symmetry, you could fudge it by say inserting some extra dwell at a second-to-last station, but really, forget about it. I'm not going to allow it because it would just waste your time! 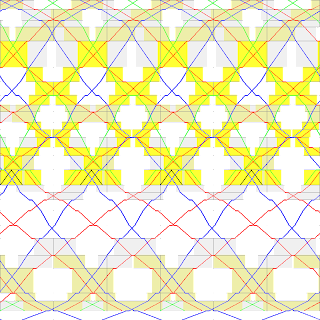 If things aren't quite symmetrical to one part in 120, just blame some pesky spin-0 boson and move on. BTW it's easiest to play about with the program if you just do one direction (S or N-bound, eg "&=direction=s", eg "direction: SB only" pulldown menu) ) to start with. Much less clutter, much easier to get the overtakes sorted out. Only later, and only if you feel compelled to be complete, do you need to set up the reciprocal northbound time offsets. Surely you remember something from when you were doing your homework. An "Ah hah" moment, during the first iteration or so, when analyzing the planned tracks it came up with something other than 12. Were you planning to make a constructive comment at some point? The TJPA/PCJPB/CHSRA Transbay configuration with separate and unequal and incompatible classes of platform tracks serving different height platforms is something of which I could never have conceived, and hence nothing I (or any sane person) ever thought to have modelled. So I have no informed idea of the train throughput of the station as presently "planned". Oh and if anybody wishes to buy me a copy of www.opentrack.ch, go ahead. San Mateo was chosen as the break point due to difficulty in quad-tracking in that area. I presume the reason is that the shorter the distance, the more it matters to serve the correct microdestination, and not just a macrodestination such as "San Francisco" from which one would need to take a connecting bus. Silly me. Of course not. You were planning things with two tunnels. Thanks Alon for your excellent suggestion. In my timetable, there was no one-seat ride from Transbay to relatively closeby stations like Bayshore and San Bruno. Since I really want Express to go all the way to Transbay (commuters from South Bay to downtown SF demand it), the problem can be solved by cutting off the Semi-Experss instead. Side benefit of this timetable is that the number of track segments with yellow highlighting has reduced to 8. This timetable starts off with a local running the length of the corridor at 15 minute intervals, and 3 'express' trains running at 30 minute intervals. 4 tracking is assumed for at least 1 station either side of both Millbrae and Redwood City, preferably two stations. 1 'express' train runs from San Francisco to San Jose, stopping at Mission Bay (4th/King), Millbrae, Redwood City, Palo Alto, Mountain View and Sunnyvale on the way. The other two 'express' trains are really one train expressed in two segments. It stops at Mission Bay, Millbrae and Redwood City before heading off to Altamont via Dumbarton. Where possible, there are timed connections between the local and express trains, assuming the logical method of cross-platform transfers. @Clem (and @Richard): Looks like there is an assumption being made regarding the RWC/Dumbarton junction being grade-separated, in that south-bound traffic (to Dumbarton) is not blocking north-bound traffic (from San Jose). Grade-separating that junction is challenging because of Woodside Road, but there are some pretty simple ways around that. Ultimately it depends on how you plan to grade-separate the rest of Redwood City. Tracks are elevated through Redwood City (passing over Whipple, Brewster, Broadway, Jefferson, Maple, Main -- but not Chestnut!) before descending. Inner (slow) tracks pass under Hwy 84 (Woodside Road) at around existing grade level. The outermost (fast) tracks dive earlier and perhaps more steeply, with the easternmost (southbound/westbound) track passing under the slow tracks in the vicinity of the 84 overpass before joining its companion in a two-track trench that runs all the way to the tunnel portal at the edge of the bay conservation lands, passing beneath numerous roads including Hwy 101 (which would be reconstructed to avoid the present flooding-prone dip under the old Dumbarton freight spur. The downside of this is that I see no way to keep Chestnut Street in Redwood City open because the three different elevations jammed up around it: Dumbarton-Altamont tracks at level -1; Palo Alto-San Jose tracks at level 0; Highway 84 roadway at level +1; Redwood City-SF tracks at level +1 over Main Street. There might be some sort of whacky roller-coaster alternative involving all the tracks diving under Main before the slow tracks bob up again to pass over the fast tracks but under 84, but I'm dubious, admittedly without trying to pencil it out. Somebody should get paid the big bucks to sketch it out and write a nice bloggerific exposition. Somebody. Sometime. Somebody should get paid the big bucks to sketch it out and write a nice bloggerific exposition. No need. There won't be enough traffic to need elaborate flyovers or duckunders... will there? Adirondacker: Just because there are non-grade-separated junctions all over the Northeast doesn't mean it's a good idea. Having paths cross over each other is a sure way to limit capacity and make schedule coordination much more difficult to implement effectively. Alternately, if you're so convinced that service levels are low enough, perhaps you could show us a timetable that doesn't create conflicts between northbound Peninsula trains and southbound Altamont trains in that area. Since you're elevating through RWC anyway, you could also bring the Altamont tracks to a high aerial (level +2) over SR-84. This would descend to a low aerial over Middlefield, then do whatever. You could probably keep Chestnut open this way, since no tracks have to dive from +1 to -1 before the junction. A high aerial could be undesirable in its own right though, as I'm unaware of the costs of such structures and how even a short segment might fit with the surrounding landscape. I'm not the one saying that there will never be more than 12 trains an hour into Transbay. Either you have the traffic for elaborate flyovers or you don't. Like I said, show me a timetable (the tools for creating one are literally at the top of this page) and I'll believe you. From what I've seen, there are too many other interdependent things to consider on this line to assure that there would be no scheduled conflicts at Redwood Junction. And elaborate? These are tiny concrete bridges, not tunnels under skyscrapers. "Either you have the traffic for elaborate flyovers or you don't." Reliably passing between opposing traffic coming at line speed at grade is difficult. Much above 4tph or so it is as good as impossible without the most exceptional operating discipline. And that's assuming an approach of stopping (on a parallel holding track so as not to delay followers = $$), then dwelling and waiting for a break in traffic, and then restarting. Think about it for, oh, 90 seconds and the light ought to dawn. I'm glad I live nowhere nearwhere somebody who thinks otherwise might ever be in command of a motor vehicle making a left turn on a two lane road. Sometimes concrete is the correct solution. At some point you need to grade separate the interlocking. Since there's a capacity constraint of 12 trains an hour at Transbay, is it a problem? Since there's a capacity constraint of 12 trains an hour at Transbay, is it a problem? You tell me. If you can generate a service pattern that creates no conflicts, I'll believe you. If you're too lazy to create your own timetable, just modify Clem's example. combine with the three other lines that share it. No, the question was whether you could avoid separating Redwood Junction GIVEN the constraints and operational requirements of the CalTrain corridor. Cross out Newark and write in Redwood City. But then if you do that at peak you have 17 trains an hour and that's 5 more and could ever possibly go to Transbay. Does this come with the additional restriction that local and express trains are coordinated at Syracuse, erm Hillsdale and cannot pass at NY Penn, erm San Mateo? I'm staring at the NJT track map, and I honestly don't see high-traffic flat junctions with opposing traffic. The junction between the NEC and the North Jersey Coast Line is grade-separated. The Kearny Connection is also grade-separated; Morris and Essex trains to Penn have to cross opposing Morris and Essex traffic from Hoboken at grade, but because the reverse-peak frequency is low, this is a conflict of low traffic. The Raritan Valley Line uses wrong-direction track entering Newark Penn, but again there's not much reverse peak NEC traffic (6 tph) and the NEC is four-tracked there. Eastbound Raritan Valley trains normally come in on Track 1. If they have to loiter at Newark they come in on Track A and loiter. Nice cross platform transfer to PATH or same platform transfer to New York's Penn Station if they are on 1. The train then toddles off to the yards or to Hoboken. Westbounds normally leave from track 5. The Service Pattern Generator seems to be acting up at the moment. Can Clem or someone else set it straight? "The Service Pattern Generator seems to be acting up at the moment." Ah ... "works for me". Please explain the problem. I did make a couple updates last night (it's now possible, though undesirable, to have trains that run NB-only or SB-only; I added a synoptic columns that show the union-over-time closeness-of-overtake situation; I fixed a small bug). I apologise if I introduced a problem, but I need more information than "acting up". Please contact me with a test case. For the purposes of this competition, its a lot easier if you assume that the junction between the existing Caltrain corridor and Dumbarton is grade-separated; ie, no flat junction. Even at the anemic traffic levels which some people consider is appropriate or possible, the grade separation is a good investment. The whole point of the exercise to figure out how cheaply Caltrain can be upgraded. I have to laugh at you Californians. Come look at the NEC from NYC to Wilmington, the Harrisburg line out to Paoli, the Metro North lines to New Haven or Croton, etc. None of them would work with only short sections of 4th track, or only 3 tracks for the distance. You need 4 tracks all they way down the Peninsula corridor to run frequent HSR and Caltrains commuter service at the peaks. You also need a minimum of 5 to 10 miles to perform overtakes of locals. Get a clue, get off the computer and forget the silly simulations and the rest of the nonsense and come watch real railroads in action that actually do what you are trying to do. With just one commuter line and only HSR for SF, I don't see where you would ever need more capacity. LIRR Babylon, with twice the ridership of Caltrains, only needs 10 trains per hour at the peak. Amtrak operates 6-8 (short) trains per hour at the peak out of New York City towards the south. Its hard to believe San Francisco can't pull off what they need with 18 trains per hour each direction at the peak. Andrew, by Swiss standards, the LIRR is a hagfish. That's all I'm going to say. "The capacity could go way up with a loop track design." I can't imagine why nobody never had any this or any of these incredible NEC-esque insights before. You poindexters with your simulations and all your high-falutin' thinkin' and plannin'. Drill, baby, drill! Andrew, what we have here is a culture clash. What we have described on this blog calls into question a certain railroading subculture that is prevalent in this country, and to which you seem to belong. A culture that accepts that trains can routinely be late by 10 minutes for no apparent reason. A culture that views train dispatching as a reactive art, not a proactive art. A culture that rejects smart thinking and Ph.D's in favor of deeply rooted tradition and steel-toed work boots. A culture that views passengers as not much more than self-loading freight. That's something we can't solve here. As others have pointed out, European and Asian railroads have a different culture, one that I believe we can learn from. We certainly ought to, given that billions of dollars of infrastructure investments hang in the balance. Work smarter, not harder. Elektronik vor Beton, as they say in Switzerland. "come [to the northeast US to] watch real railroads in action that actually do what you are trying to do." Depends what you mean by "what you are trying to do." We can't blame them for trying to be more predictable (and faster) than the NEC and LIRR. Hey, guess what, computers can be used to model reality! Clem, Richard, the full slogan is "Organisation vor Elektronik vor Beton." This is actually important - the LIRR's latest money waste comes from a failure of integration between the LIRR and Amtrak (namely, they keep separate concourses at Penn Station) rather than a failure of signal capacity. Also: if Andrew is the same Andrew who writes on Second Avenue Sagas, then he's attached to the practices of the MTA, not old-time railroading. His views on running the LIRR like rapid transit are more progressive than you'd think, since the MTA head wants to slightly reform them (i.e. give conductors smartcard readers so that they can e-punch tickets faster...). (i.e. give conductors smartcard readers so that they can e-punch tickets faster...). How do electronic tickets make the train run faster? They don't make the train faster, but the theory is that they allow conductors to work the trains faster, so that there will be fewer of them on each train. And as for Transbay, at 6 tracks with generous lengths and platform widths, that should accomodate 18 trains per hour. You've missed an obvious point. Transbay won't have 6 tracks, it will have 2 dedicated Caltrain tracks and 4 dedicated HSR tracks, with no way of interchanging the two due to incompatible platform heights. 4 tracks will probably be sufficient for HSR, but will 6tph- actually more like 4tph in the real world- be enough to turn round all the required Caltrain services, for now and evermore? Transbay also won't have "generous platform lengths and widths". Because of obscenely poor "decision"-making and alternatives "analysis", the only available station site barely has space for 400m platforms, with no overrun margin. This means that full-length HS trains, should they ever manifest themselves, will be required to make their approach at extraordinarily low speed, which will degrade platform capacity as well as causing even worse congestion in their hopelessly, inflexible and misconfigured station throat. Even worse is the matter of "generous widths". Because the "engineers" who "designed" the structure had never seen or imagined a working railway station, they determined the structural grid of the massive (and almost completely unnecessary!) above-ground edifice with absolutely no regard for the fact that there was to be a train station underground. The result? 5 and 6 foot diameter structural columns placed every 52 feet (feet! Good God!) along each platform, and no allowance whatsoever made for vertical circulation. Single unidirectional unbanked escalators. Narrow single-flow stairways. Heavy platform congestion is guaranteed. Add to all this the "design" of having airside holding pens at a far worse than useless mezzanine level (these people have clearly never gotten beyond NY Penn), and you have a perfect recipe for long platform access and egress times. I know I sound like a nut, but this is four billion public dollars being incinerated in front of our eyes, and the only CBD station site in SF quite literally being destroyed. Wrong in every way at every step. In short, it's about the worst thing anybody could have come up with. You can thank, among others, Parsons Transportation Group and ARUP USA. Ask for them by name. World Class Professionals! By the way I made some enhancements to the train graph generator. It now generates textual grid-o-riffic tables of train stopping times. Let me know if there are problems. PS After a bit more research and observation, I suggest that closer to 20 than 30 seconds is an achievable dwell time for non-obsolute (multi-door, level boarding) future rolling stock in intra-regional (ie Caltrain) service, except perhaps at the heaviest use stops. As ever, this is only for armchair poindexter engineer types who prefer to analyse and evaluate before or instead of writing the blank checks made out to the Legitimate Businessmen in the construction industry. Wrong in every way at every step. They getting what they voted for. In 2211 I'm sure Oakland will be very grateful. Here is my proposal. The southbound-only multi-tracking seen between Broadway and Burlingame is an artifact of my not being able to input fractional minutes. Features: Swiss-standard 7% padding, 20-second local dwells except at major and overtake stations, and the local rather than express trains go to Tamien (awkward, I know). The result is that the express trains do SF-SJ in one hour minus reasonable turnaround time, and the locals do SF-Tamien in one hour and a half minus turnaround. Tight, but probably cheaper than extra crews and equipment. Here, the biggest advantage of Pacheco - higher frequency - becomes a liability, since more trains muck up a longer section of commuter track. Therefore, only Altamont is included. Sorry, Gilroy. @Alon Your link didn't come through, at least for me. You also say "multi-tracking seen ... is an artifact of my not being able to input fractional minutes." My guess is that real world imperfections in trains really running on schedule are going to be bigger than that, as much as we wish we could be Japanese — or even Swiss, who are slovenly in comparison! PS @Richard: I notice there may be a bug in the program. Trains with a long dwell at their terminal (eg Altamont-SJ 120s) are shown as departing at the after that dwell northbound. (eg "0" departure time in the form comes out as :02 in the output. @Anon: it's close, yeah. Here is a working link. But I picked my symmetry axis a little differently, so that the overtakes require slightly less four-tracking than in your link. Hello everyone, here are my proposals. The core of all the following schedules is 3 Caltrain local tph and 3 express tph. No way the Peninsula will require more than this. With the Pacheco scenario, we throw in 3 HSR tph, which should be enough (THSR runs 4tph). Included is a Dumbarton local, just for fun. The result is something very similar to Clem's proposal; using 125 mph HSR trains saves about 4 miles of quad-tracking. I tried adding an express HSR train, but it just didn't work out. No matter, peak hour freeway traffic cancels out the deficit of stopping at RWC & Millbrae. If you want to get really crazy (or there's a lot of demand from Socal, because it won't be from Sacramento), here's 6 tph via Pacheco. Quad-tracking is added btwn Bayshore and San Bruno, as well as between Palo Alto and San Antonio. Altamont coming in second post, hit character limit. Next is the basic Phase 1 Altamont scenario, throwing in 3 tph to SJ and SF each. (Even 2 tph is probably good enough.) The same amount of quad-tracking sans the portion in Mtn View is required for this proposal. But of course, some trains can and should head to Sacramento! So 4 tph from each terminal seems more reasonable, 2 to Socal and the northern Central Valley each. Hence this Phase 2 schedule. Since I have better things to do, I just basically added an additional 3 HSR tph on top to the Phase 1 schedule. 2 of those slots will thus be empty. This phase adds additional quad-tracking between Bayshore & S. SF and Burlingame & San Mateo. Now that I think of it, there may be issues with running these HSR trains so close to each other in the second phase...I'll think of a solution. 2 HSR per hour, 2 Baby Bullet per hour, 4 skip-stop trains per hour with alternate stopping patterns. All this requires is quad gates on the grade crossings for 100mph operation, electrification and a new Caltrain fleet, and construction of Transbay and the DTX. Oh, and I'm assuming the upgrade of all stations with compatible platform heights. Minor details. You could add Tamien service quite easily, I was just too lazy to do it. Though it might be better to run a DMU service from Gilroy to San Jose and serve Tamien that way. Jon, please change the color of your skip-stop lines to something other than yellow. It's impossible to see against the yellow background of the four-track sections. Also, you should slightly increase the separation between local and express trains at the north end, so that the approach can be two-tracked. It's fine if the SJ area is four-tracked, since there's space there. You can't increase the separation at the start and end of the line any further without cutting out stops. I already had to have one of the skip-stop trains miss Mission Bay for that reason. Santa Clara to San Jose is already quad tracked, and Mission Bay to Transbay will be triple tracked, so it's a moot point anyway. btw I knocked this up in my lunchtime and I've since noticed that it performs poorly for certain origin/destination pairs. I don't have time to do it, but I think it could use tweaking by reducing the number of Baby Bullet stops and adding a few stops to the skip-stop services to cover origin/destination pair gaps. I'd just like to add that Skip-Stop should be avoided as much as possible. It really will confuse people who need to access the local stops. FIxed the bug "Trains with a long dwell at their terminal ... are shown as departing at the after that dwell northbound.". Thanks for the clear report, and my apologies. This is an incompatible change: my apologies to people who have already spent time designing patterns to millisecond accuracy only to find that some trains have shifted by a couple of minutes from where you thought they were. Alon, I'll do sub-minute departure initial times soon, just for you, despite the confusion of "precision" with "accuracy" being one of the banes of a numerate existence. Something is not right... a 79 mph KISS should do Transbay - SJ in 42 minutes non-stop. Why is it 52 minutes in your test case? Oops, my mistake. Including your 10% pad, the run time is 47 minutes exactly as shown in the string diagram. Ugh. This should be somewhat more workable. The HSR trains are restricted to 100 mph, which costs them a grand total of 2 minutes. 90-second HSR dwell at Millbrae (50 would make life so much easier...), no fractional minutes, and no four-tracking in Burlingame or north of Bayshore. Note also that the only need for four-tracking at RWC comes from the Dumbarton Shuttle. Fixed the bug Clem reported in which displayed terminal arrival time in the text tables was arrival plus "dwell". Alon, I believe that fractional minutes offsets work. Just for you! (It was always possible as it happened, but the "UI" form input didn't allow more than two characters to be entered.) Specify decimal minutes, not minutes and seconds. Another feature: the offset may be negative. This is useful if, for example, one "anchors" a scenario with express departing at :00 (as I do). Then one can have a preceding overtaken local depart at -8 minutes, a number which doesn't change if one changes the train headways. (A +7 offset with 15 minute headway would need to be changed to +12 for 20 headway.) Gauss would be so impressed by the advanced use to which I've put my education. Just wondering, how hard would it be to incorporate some sort of measurement of quality of service into the timetable generator? Joey, That (generating a "metricator" figure of merit) is an obvious next step. Work in progress. Still slow (very inefficient computation, and implemented in one of the world's least efficient programming languages) and not ready for or tolerable by others yet. No pressure. I was just wondering. For the sake of trolling, here is a 6/6 tph schedule in which (some of) the Caltrain express runs are actually HSR trains. Call it the Caltrain express to LA or wherever. Output now includes a large table summarising the hourly "effective" trips between each origin/destination: ie I turned on the graph shortest path finder and made it spit out the best connections, including transfers, it could find between all station pairs. FYI the minimum connecting time for a same-direction transfer is 45s (ie local must arrive at Hillsdale 45s before express departs in order for a linked trip that involves local+express to be generated) and the minimum for opposing-direction (eg back-ride away from destination to reach to a station with better service) is hard-coded at 180s. As you might suspect, this set of trips is all that's needed the generate Clem's "Metricator" timetable figures of merit number(s). I just haven't managed to make my numbers quite correspond to his yet. In the meantime, enjoy the whacky connections that can be found in, for example, the whacky "Caltrain 2011 AM" or "Caltrain 2011 PM" recreations to which I posted links above. And, of course, as ever, sorry in advance if I broke something. Hello again, everyone. Before I leave, here's my revised Pacheco schedule. Changes include express service to Tamien, and some tweaking of dwell times to further minimize quad-track construction. If you want to add more HSR trains, I suggest giving the passengers on the peninsula a one-seat ride by having the train make BB stops. Okay, with the 45-second rule, here is the revision to my serious schedule, using fractional minutes (thanks, Richard!). There's a small bug you should fix: the system sometimes asks the user to make inconvenient transfers. For example, on my schedule, the trip from San Francisco to California Avenue is an express train to Palo Alto, with a five-minute transfer to a local. In reality, the transfer penalty models I know believe that people prefer to be on a moving train than on a platform, which means they'd transfer at Hillsdale at zero penalty. Hi Alon, the issue you report is one I almost certainly won't address. It doesn't affect the final output (which is end to end trip time, regardless of moving vs stationary time); just the particular choice of location at which transfers are reported as having taken place between the trains. I use a bog-standard graph shortest path algorithm, where the "shortest" metric is simply end to end time, and any attempt to tweak it to use some other nice-transfer-favouring cost metric will just lead to many hours of wasted time (I hate computers!) for no real improvement. So just treat the generated trips-including-transfers tables as Too Much Information: informative perhaps, correct in a strictly technical sense, sometimes a little surprising (when exotic reverse-direction transfers or multiple transfers not obvious to casual human inspection are the shortest), but not anything one really need to worry one's pretty little head about too much. If you need better, you're always free to spring for a copy of opentrack.ch! OK. Alon doubled my salary, so I had no choice but to give him shorter transfers. I am not the Andrew who writes on Second Ave. Sagas. I do have pretty progressive views, but I also have realisitic views informed by history and reality and work as a railway professional. I will simply say that a lot of halfbaked urban rail lines have been built in this country in the past 30 years which are too slow because of "economization" when it comes to trunk capacity, and there is a lot of yearning for costly and overly palatial terminals like those of yesteryear. You can see the fate of overly palatial terminals in any city in the US. And you can see the problems of reduced trunk capacity on almost any urban main line with passenger service. There is also a lot of engineering and operational wisdom that was developed in the period 1890-1940 that is now being thoroughly discounted because some people with little practical experience are regurgitating "answers" out of a computer with little consideration for the failure of humans (and trains) to follow computer outputs. What California is proposing is not something like what is in Europe, where HSR lines generally share 10-15 miles or less of the main line system out of a city, and it is not something like what is in Japan or Spain, where the main line system is a total different gauge. The joint Caltrain section is 50+ miles long to get out of San Jose (and another 50+ miles north out of Anaheim). It also seems like there is some desire to run trains down the existing line to San Diego as well as over the new line via Riverside and Escondido. The only thing that is really like it is the Northeast Corridor. Don't run away from it to embrace aerial castles. @Andrew: couldn't agree more, it makes zero sense to mix HSR and commuter rail for 50 miles. That much is obvious just by looking at the output of toy computer models. @thatbruce: Adirondacker12800 was kind enough to send me a copy of the 1957 timetable for the peninsula commute. I will put it through the metricator at some point. You can clearly see that the corridor used to be strongly oriented towards San Francisco, e.g. with no fewer than 8 (eight!) trains leaving within a span of 40 minutes during the PM rush. Note Atherton had pretty good service back then. If you want to knock the metricator for a loop, I have a copy of a timetable from August of '66. 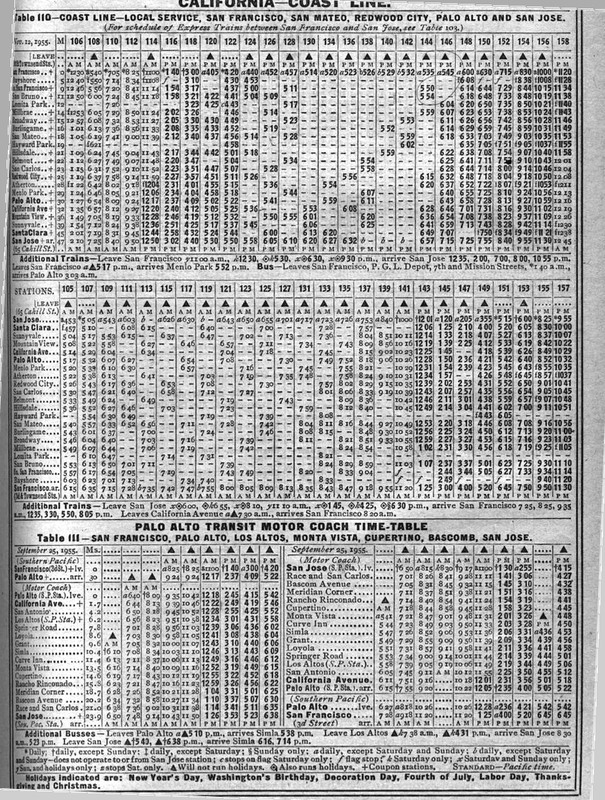 By which I mean I have a copy of a San Francisco & San Jose Railroad timetable dated August 1, 1866. I recall lots of suits (some with hats, even!) riding between Atherton and SF back in 1980. The parking lot was relatively full too, with lots of suits being dropped at the station too. After a few days (and some very boring meetings), here is a graph of the 1957 SB between 1600 and 1759 . Trains in black departed SF between 1600 and 1659, and trains in red departed SF between 1700 and 1759 (see next post for these two individually). Some obvious caveats: This is a good example of a daily exodus, but not of a reasonable commute (eg, miss your regular evening train and you're stuck for a bit). The first graph combines them both. The second two graphs show them per hour, as long as you ignore the repeat (I couldn't figure out how to have a given train run once). Richard's fine form doesn't have performance characteristics for whichever older engines were used at the time, so there are some oddly long wait times to bring them back on schedule. On the other hand, some stop sequences have rather short timing in order to keep schedule. Stations have changed, in particular Lomita Park is no longer (would have been a good location for Caltrain/BART transfer if planners cared about the airport traveler), while 22nd St, Oakdale, San Antonio, Lawrence and College Park are new since 1957. Trains in black departed SF between 1600 and 1659, and trains in red departed SF between 1700 and 1759. Just returned after riding on the ICE from Paris to Frankfurt. High speed passenger rail, freight and local passenger trains operating effectively on only two tracks. Why would four be needed all the way up the peninsula? Richard: ugh, another bug... in my latest-linked schedule (this, again), the Redwood City-Burlingame trips are asymmetric. In one direction, passengers transfer at Hillsdale and the trip takes 13 minutes. In the other, they don't and it's 16. I'm pretty sure the connection time is the same at both ends, so what's the problem? Or unreasonable working hours in 2011. Well into the 80s asking employees to work overtime wasn't done much. If you worked 9-5 you worked 9-5. There were no laptops or cell phones. Only doctors and other very important people had beepers. For most people when you left work you left work. So here's an out-of-competiion non-entry. * The basic service is limited stops SF-Redwood City, thence all to San Jose. * To fill the gaps, an all-stops local shuttles Redwood City-SF, timed for cross-platform transfer at a four-track, two-island Redwood City hub. Very minimal infrastructure; quite nice service; not too much service. * 2tph Altamont HSR: works with 2tph S.Mateo + 4tph SCExpress with no extra passing track. All this can be done (phase 1) just with a four-track Redwood City station and quadrupling solely north of RWC through Belmont. Nice! * Add 4tph Altamont: requires Bayshore-Millbrae quadrupling (full build-out) for HSR/S.Mateo overtake. Also allows 4tph S.Mateo, for which demand is unlikely. Los Banos HSR additionally needs a Redwood City-Cal Ave overtake for 100+mph FL0 airline blast-throughs of PA-MP-A. Classy! So what's this $16m all about again? Reality Check: the $16m is to be piled into a heap, doused in gasoline, and set aflame. Then several hundred million more will be added. CBOSS. Designed and implemented by America's Finest Transportation Engineering and Planning Professionals. I hope they all die in a fire. 2tph San Mateo Local, 2tph Santa Clara Limited. 0tph SF HSR, 4tph SJ HSR. 2tph San Mateo Local, 2tph Santa Clara Limited, 2tph SF HSR, 4tph SJ HSR. 2tph San Mateo Local, 4tph Santa Clara Limited, 2tph SF HSR, 4tph SJ HSR. 4tph San Mateo Local, 4tph Santa Clara Limited, 4tph SF HSR, 4tph SJ HSR. 4tph San Mateo Local, 2tph Santa Clara Limited + 2tph Santa Clara Express, 4tph SF HSR, 4tph SJ HSR. Quadruplicate Bayshore—Burlingame, Belmont—California Avenue, Santa Clara—Tamien. Quadruplicate Bayshore—Burlingame, Belmont—Sunnyvale, Santa Clara—Tamien. Here's a variant on RM's S-Bahn Pacheco Phase 1 schedule. I can't help but notice that this configuration allows the RWC locals to be extended to Fremont in the future. * 1-hour SJ-SF express, the successor to today's Baby Bullet service, great for PR purposes. Running at 100 mph allows for two more stops, San Mateo & California Avenue, to be served. * In addition to Hayward Park & Atherton, Broadway is permanently closed, as it's too close to Millbrae (6 tph, 4 of them express). * Minimal quad-tracking needed by placing the southern overtake between California Ave and Mountain View. * Also note that the reverse peak limited and express trains make different stops. I also made some other Phase 2 and Altamont schedules, I'll put them up later. 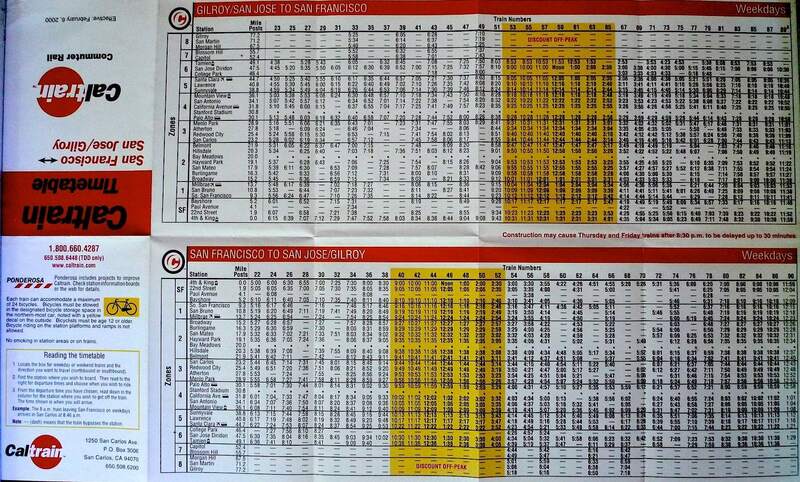 Also, does anybody have a Caltrain schedule circa 2000-2001 that they could share? I'd really appreciate it. Where would the overtakes in option 3 be located at?